Wedding planning isn’t usually part of our work at Rush. But a team from across the Medical Center recently worked together to make it possible for a dying father to see his daughter get married. Rachel Halonen and Ian Marano were wed in a quickly arranged ceremony in the Rush Chapel on Saturday, Dec. 21, followed by a reception for 70 friends and relatives. The Chicago couple had planned their wedding for this coming September, but they moved up the date and changed the location when they learned that Sam Halonen, Rachel’s father and a patient at Rush, only had days left to live. Sam suffered from myelodysplastic syndrome, a bone marrow disease that impairs the production of certain blood cells. Diagnosed with the illness in the summer of 2012, Sam had received a stem cell transplant at Rush in March and had spent most of the past six months hospitalized. On Dec. 17, Sam’s physicians told him and his wife, Penny Halonen, that he was near the end of his life. Rachel and Ian quickly decided to try to hold their wedding at Rush that weekend and asked Sam’s caregivers for help arranging it. They were directed to Eleanor Welch in the Department of Religion, Health and Human Values, who made the Rush Chapel available. They also sought out Terry Maynard, director of Hospital Guest Relations, who helped arrange for the use of Room 500 for the reception and coordinated the donation of a wedding cake from catering. The Room 500 staff donated the use of the space with a bartender, and Vivian Lee, the facility’s assistant manager, arranged the food and decorations. Billy Dishuk, supervisor of Room 500, was integral in making sure that the wedding reception ran smoothly and all the chapel needs were met. On the day of the wedding, Dishuk personally fetched tape from his car to make sure the florist was able to quickly assemble decorations in the chapel that weren’t staying in place. The collaboration also included parking services, which donated free valet parking; and Security Services, which helped direct guests from the chapel to the reception and helped find a lost phone that contained video interviews with Sam. Sam’s caregivers in the hematology and stem cell transplant unit on 14 East Tower were able to stabilize him so that he could attend the wedding. “It wouldn’t have happened without collaboration from all the nurses,” says Elizabeth Vaclavik, RN, MS, the unit director. Elizabeth Light, RN, and Julia Nash, PCT, coordinated how Sam could be brought from his room to the wedding and what his medical needs would be during that time. They worked closely with Sam’s physician, Henry Fung, MD. Nash also accompanied Sam to the wedding, monitoring his condition and oxygen tank levels. After the ceremony, she brought him back to his room for additional care, then took him to the reception at Room 500, where he spent an hour. 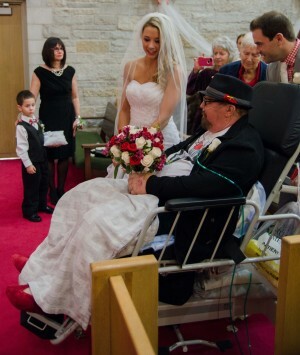 In addition to her gratitude for making the wedding possible, Rachel and her family praise his caregivers for their work with him and them throughout his illness. “The physicians, nurses, techs, and support staff we encountered over the course of Sam’s grueling ordeal showed impeccable professionalism, interpersonal sensitivity, and an appreciation for our circumstances that surprised and moved us,” they wrote in a thank-you letter to Rush’s leadership. Sam died on Christmas Day. Rachel and Penny were at his bedside, along with his son Graham. Sam was a professional musician, and a Rush chaplain played the piano on the unit during his final hours. The family has asked that donations be made to Rush’s Bone Marrow Transplant Fund. This entry was posted in Cancer, Patient Stories. Bookmark the permalink. A beautiful story for a beautiful bride and her wonderful family. Special thanks to Rush for making it happen for all of them. Beautiful memory of a dad, wife, daughter and son as they welcome a new family member and cherish an anchor in the family! So much emotion! Congratulations and may God continue to strengthen the family unit!